Happy Thursday everyone! WOW…I can’t believe it’s Thursday already! I sort of lost track of time this week. Of course though, I’ve been busy getting things designed for Create with Connie and Mary LIVE that is coming up in July! Are you coming? I HOPE SO!!! We have such GREAT projects and so much fun planned for you! Head over to Create with Connie and Mary to sign up NOW! 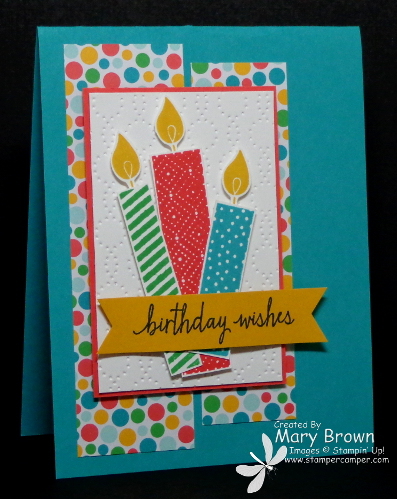 Oh…let’s get back to my card…I had a card class this past week and we did the candles like this one a card. I REALLY liked the look of the candles and decided they would work perfectly with today’s sketch challenge…and they DID! Don’t you just LOVE it when that happens? I do! What a fun celebration card with all the bright colors! Love those three candles! Love the colours – such a cheery birthday card! Love the embossing folder too – both you and Connie used it and I didn’t even notice it in the new catalogue! I am loving all of the bright colors I am seeing with this new paper! What a super cute card, Mary. It is bright and cheery, and stands on its own without embellishments. Love that! Can you tell that I am drawn to these colors, too!? Your card is so celebratory and fun! Love it! What a festive birthday card! I love the bright colors; those large candles are such fun and work great with this sketch!